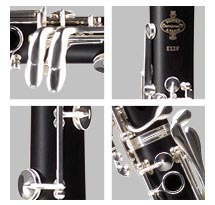 Developed through industrial synergy between the Buffet Research & Development arm and their Production facilities based in France and Germany, the new E12F student clarinet comes onto the world market offering a new level for intermediate clarinets. Its body is derived from professional models and made in Buffet Crampon’s French workshops; the key assembly and quality control are carried out by Buffet Crampon German teams in Markneukirchen. We are very excited about this new model clarinet and we are sure you will be too once you test play this beautiful instrument.